The scenes are designed to be sobering reminders of the worst consequences of getting behind the wheel while intoxicated. 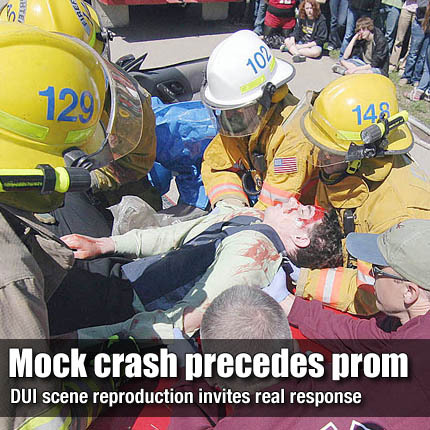 Kansas Highway Patrol troopers led the mock incidents and assemblies in preparation of the prom and graduation season, reportedly the worse season for teen drunk driving wrecks. “One silly mistake on these nights, and you’re going to prison, or you’re dead, or your friend is dead,” said KHP trooper Dax Lewis. Troopers, paramedics and students involved in the mock accident spoke the assembly at SFTHS. “The small decisions you make can have big consequences,” said SFT senior Chloe Cowen, who played an amputee in the accident, in which she was loaded into an air ambulance. Troopers answered questions about other possible contributors to DUI wrecks and convictions, including prescriptions and narcotics. “Anything that impairs you can lead to a DUI,” Lewis said. Fellow trooper Kody Olsen ended the solemn assembly with positive note for the upcoming prom. “Have lots of fun, enjoy it, make memories, but be smart,” Olsen said.